I apologize in advance for breaking any suspense right from the start, but I will begin this review by saying that this was the best YES related concert that I have seen in at least 15 years. The reasons for this are many, but ultimately it comes down to the quality of the performance. I literally enjoyed every moment of this show and it served as a significant reminder of why I am a long time fan of the band YES. This line up of musicians absolutely brought the music to life and made well worn songs somehow seem fresh again. The thunderous applause and multiple standing ovations they received were a testament to the absolute quality on display. 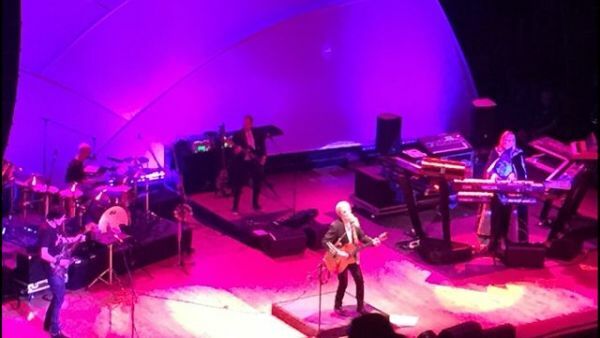 I have seen YES many times over the last 35 years, but it has been a long time since I heard their music performed with such gusto. I will admit to not being too enthusiastic about some of the YES shows I have seen in recent years. I wouldn't call any of them poor, but at times, the band has seemed to be going through the motions. I didn't get that sense at all with ARW. There is also the irreplaceable element of hearing this music sung by Jon Anderson. I am by no means a naysayer of current Yes vocalist, Jon Davison. In fact, he is a bright spot of the current line up. That said, Jon Anderson is the true voice of this music and seeing him perform it live is always special. His work throughout this evening was fantastic and was matched equally by his bandmates. I am of the opinion that Trevor Rabin brought new life to Yes back in the early 80's. This show being any indication, it seems that his talent has again sparked a new energy into the Yes universe. There was an edge to even often played classics such as I've seen all good people, And you and I and Long Distant Runaround. From a setlist perspective, they did an impressive job of combining some of the memorable standards of the 70's catalog with great Rabin era tracks of the 80's. This alone helped to create diversity in the music that hasn't been heard from the band Yes in a number of years. Rick Wakeman has not lost a step. He too was a joy to watch and his work during the classic Awaken, was mesmerizing. There was something truly special about watching all three of these masters perform this music. The great news is that they didn't rely on their reputations. They performed each song with clear enthusiasm and passion. The band was rounded out by Bassist Lee Pomeroy and Drummer Lou Molino, both of whom were outstanding. 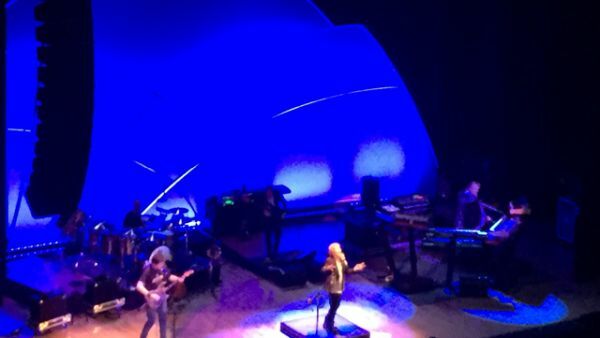 Pomeroy performed a tribute to the late Chris Squire which brought the crowd to its feet. It was fitting as there seemed to be a wave of emotion running throughout the entire evening. That feeling likely came from watching these legends perform the music of YES in such a meaningful way. Calling out highlights is a bit tough as the entire show was a success. Some key moments for me though came from hearing performances of Rabin era favorites like Hold On, Lift Me Up and Changes. Even Owner of a Lonely Heart, which has been a bit overplayed by Yes over the years, contained an energy that Steve Howe can't find in the song. That is now a slight on Howe, but more so an indication of the personal stamp that Rabim has on the song. Back in 1983, This song introduced most Yes fans to him and the enthusiam he has for it showed in his performance. This was showcased most vividly by an extended guitar/keyboard interchange between Trevor and Rick as they walked through the crowd. At this show in Los Angeles, ARW was accompanied on Owner of a Lonely Heart, by Rabin's son Ryan on the drums. Ryan is a member of the indie rock band, Grouplove. Other highlights of the concert included excellent renditions of Perpetual Change, Heart of the Sunrise, The Meeting and the sweeping epic, Awaken. The last half of this song in particular, was stunning. I guess it is abundantly clear by this point of the review that I enjoyed this concert. Interestingly enough, I generally prefer seeing newer artists over more nostalgic acts, but this was absolutely one of my favorite concerts of the last few years. The show brought back many musical memories, but there was nothing that felt stale or dated about it. In fact, as I was watching the concert, I was reminded that Yes is again a nominee for the Rock and Roll Hall of Fame. Watching these performances and the overwhelming response from the crowd, cemented for me just how ridiculous it is that this amazing music is not yet enshrined in the HOF. There is also talk of some studio material from Anderson, Rabin and Wakeman. 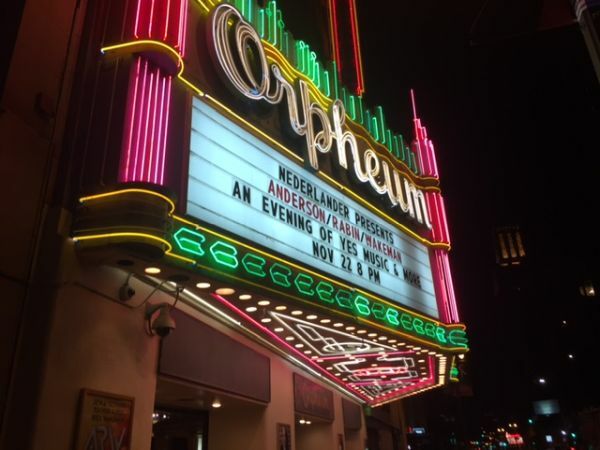 Considering the chemistry between these musicians that was on display at the Orpheum Theater, the possibility of new music is truly something to look forward to. Their reunion is truly something to celebrate.